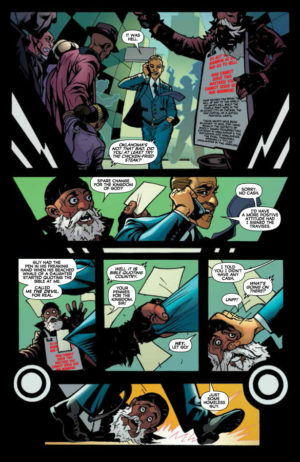 AfterShock Comics made some huge waves in the comic book industry last year releasing some stellar comic books for a start-up publisher. My personal favourite was Rough Riders but fans have nothing but praise for titles like Insexts, Animosity and SuperZero. 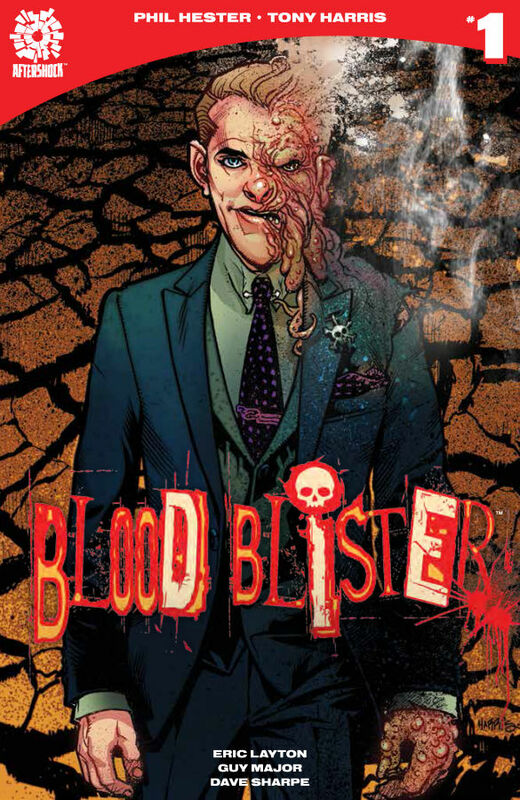 Having attracting a slew of big name talents to produce the first year of AfterShock’s comic books the second year of AfterShock aims to continue the trend of putting quality over quantity as the main focus for the company. The story opens on Brandon Hull laying it on pretty thick to a farmer and his family about the merits of signing onto a class action lawsuit. The aim of the lawsuit is to sue the State of Oklahoma for not regulating and controlling an oil company that polluted the drinking water in the area. What looks like an earnest attempt to help out a family in need turns out to be a slick act of corporate self preservation. You see, Brandon was hired by that polluting oil company to use the legal system to deflect blame and reduce their financial liability. We also see that Brandon, while being morally corrupt at work, is also not the nicest person to his son, his ex-wife and his employees. After an incident at his son’s baseball game Brandon heads into a charity Haunted House which begins his decent into hell when the book revels its supernatural aspect to the story. Tony Harris is back! Having dropped off the scene for a bit the artist best known for Ex Machina and Starman returns with his rich facial expressions but a slightly more cartoony look than I remember. Phil Hester manages to write Brandon as an almost instantly unlikable person so you feel some level of satisfaction when it appears Brandon is going to get what’s coming to him. Eric Layton’s inks and Guy Major’s colours are suitably dark and moody. The thing with inks and colours is you barely notice when they are done well, blending into the pencils and words seamlessly. But when either of these aspects is done poorly the result is jarring and instantly obvious removing the reader from the story. So in this aspect Eric and Guy deliver the goods. If you are into darker books from publishers like Image or the comics from DC’s Vertigo imprint you should enjoy this book immensely.